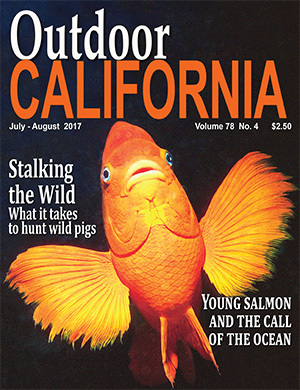 In the summer of 2016, the California Department of Fish and Wildlife’s (CDFW) magazine, Outdoor California, was recognized for the eighth straight year as the best-of-the-best by winning the Gold Award for Best Magazine in a statewide contest among public information and communication professionals. But by the autumn of that year, with a falling subscription base, the magazine faced the probability that production would cease because not enough people were reading the best magazine in the state. Outdoor California has published continually in one form or another since the 1950s. At first it was available for free. At some point in time CDFW began charging a subscription for it. The magazine’s look has changed a lot over the decades, adapting with time to become the Department’s showcase promoter. While leadership changed and policies shifted over the decades with changing administrations, the unerring focus of the magazine remained on the scientists, the game wardens and others who worked to protect, save and enhance the state’s wild animals and their natural habitat. Still, the harsh reality of shutting down Outdoor California looked likely, as the annual statement of ownership, with its telling numbers for circulation, was coming out. Each year, publications that are mailed through the U.S. Postal Service must provide the circulation data to the federal government and print a statement of ownership, essentially a notice of circulation, during the month of October. Circulation figures had spiraled downward for several years. The Postal Service statement would show the magazine still printed a healthy overall press run, but most of the copies went to CDFW offices and public retailers of hunting and fishing licenses, regional offices and the Legislature. The real number of subscribers had plunged to 1,806 households. Blame the low circulation on the country’s economic recession and a population fearful of meeting their mortgage payments. Or blame the state’s dire budget crisis that halted nearly all new promotions in state departments and agencies. Or think of something original and blame it on the uncertainties of climate change. The truth was no one had an answer. To compound the problem, the magazine was constrained in reaching out to a new audience. The idea that ultimately saved the magazine formed during a conversation with a colleague who had written for the magazine several times. We floated ideas on how to place Outdoor California before a broader audience – in general, all California residents. One suggestion after another was considered and shot down due to the reality departments faced during the budget crisis. After a few hours, the colleague declared the conversation too depressing and said he was off to a hunting trip he’d scheduled for the weekend. As he prepared to leave he questioned whether the shots he’d take hunting would be as easy as those taken at all the suggestions. “If hunting was this easy, then all these people taking a hunter safety course could save themselves a lot of time,” he said. It was like a light bulb had switched on, and the room grew brighter as the significance of what he said dawned on both men. The magazine didn’t need to promote itself before an audience of people who generally didn’t hunt, didn’t fish and didn’t enjoy the outdoors. It needed to promote itself before an audience of people who did. And those people were the ones who signed up for the safety courses presented by the Hunter Education Program. California’s Hunter Education Program is federally funded and began in 1954 to raise safety and conservation awareness. Today, as with other states, California requires hunter education training for those who have never held a California hunting license, who do not have a hunter education certificate or who do not have a hunting license from another state or province issued within the past two years. People drawn to the hunter safety program were residents who were already interested in the outdoors and the activities they could enjoy. Form a partnership with the Hunter Education Program would solve half the magazine’s problem. After that, all that remained was to convince them to purchase a subsequent subscription. In California, the Hunter Education Program falls under CDFW’s Law Enforcement Division and is led by Capt. Robert Pelzman. Pelzman jumped at the idea of partnering with Outdoor California, because the magazine could solve a problem his program had with strings attached to his funding by the federal government. Pelzman’s specific issue was a requirement to involve media outlets in promoting hunter safety programs. The grants mandated that stories appear in the local media touting the benefits of consumptive sports. His people didn’t have time to develop press releases and conduct interviews that would ultimately produce positive stories, but Pelzman saw he could use the magazine for that. The best part was that the stories would never veer from the magazine’s mission of promoting how the Department protects, preserves and enhances wildlife and the state’s natural habitat. In return, Pelzman wanted to use the funds dedicated to his media budget to raise subscribers from the ranks of those who passed the safety courses. The funds could buy a one-year subscription for 8,000 graduates, pushing the number of paid subscribers to almost 10,000 total. But there was a glitch. Under the restrictions in the federal funding, the grant could not purchase products like subscriptions. The answer came with a realistic modification – the Hunter Education Program would pay for part of Outdoor California’s printing cost. The grant was set up to pay directly to whatever commercial printer the magazine uses. The arrangement became part of the magazine’s annual printing contract, on which commercial printers would bid at the start of each year. Outdoor California has a new crop of subscribers each year, thanks to the partnership with the Hunter Education Program. The arrangement serves as a win-win for everyone: those who pass the class receive a full year’s subscription, and the magazine has a chance of these new readers renewing for another year. So at least for now, the future of CDFW’s award-winning magazine glows as bright as California’s Golden State nickname.